1 of 5 Heat oven to 375 degrees F. Line 2 large baking sheets with nonstick foil or foil coated with nonstick spray. Set aside. In a large bowl, combine shortening and 1 cup turbinado sugar. Beat together until well blended; sugar will still be crunchy and undissolved. 2 of 5 Beat in egg and extract. In medium bowl, whisk together the flour, baking soda and salt. Beat flour mixture into shortening mixture on low speed just until combined. 3 of 5 Roll 1 tablespoon dough into a ball. Dip half in sugar, and place sugar side up on prepared sheet. Repeat, forming enough cookies to fill sheets, placing cookies 1-1/2inches apart. 4 of 5 Bake cookies in 375 degree F oven for 13 to 14 minutes or until puffed and cracked, rotating sheets halfway through. Let cookies cool on sheets on wire racks for 3 minutes. Transfer cookies directly to racks to cool completely. Repeat with remaining dough. 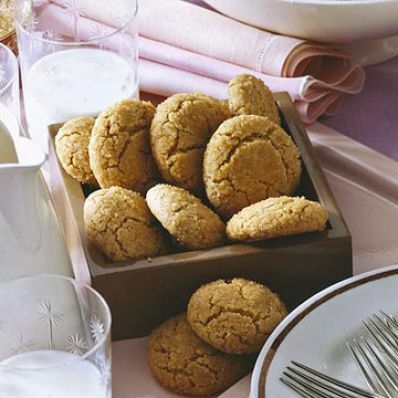 5 of 5 Keep cookies in airtight container at room temperature up to 2 weeks or freeze up to 2 months. Makes 8 dozen cookies.